X1 Technologies created a new buzz in the desktop search space today by releasing their enterprise version of X1 Desktop Search for free. The product was earlier priced at $75. I have played around with almost every desktop search software available in the market and X1 has always been a favorite. Their file preview engine can render almost any file including Visio, Illustrator and AutoCAD documents. Also, no other desktop search program comes close to X1 when in comes to supporting various file formats and email clients. How will X1 make money now ? Just like Firefox makes money by giving their product for free. X1 Desktop Search client has a Yahoo search button so when someone searches the web from X1, Yahoo will share the advertising revenue with X1. In addition to new search users, Yahoo also gets to enter the corporate desktop via X1 since existing users are likely to upgrade their installations. Should paid users of X1 upgrade to the free version ? While X1 5.5.3 introduces some new features and fixes old bugs, it comes integrated with Yahoo Toolbar and Yahoo Web Search. If you are Google or MSN fan, you may continue with the previous release of X1. What about Yahoo Desktop Search users ? YDS is essentially a stripped down version of X1 with a Yahoo wrapper. Therefore, I would suggest that Yahoo desktop search users switch to X1 since it's more advanced and feature rich that YDS. Which desktop search program should I choose ? If you enjoy more working with a standalone program than inside a web browser, nothing beats X1. Google Desktop is more suitable if you are looking for a program that can index your web browser history. It will be also be interesting to see the impact on desktop search software when Vista is released in the market. Yahoo! Desktop Search includes support for the Yahoo! Address book and their instant messenger. It’s excellent for personal use on one’s desktop and it will continue to appeal to the consumer of Yahoo! Services, at home or at work. X1 Enterprise Client is intended for intensive business use in a dynamic environment, therefore it's highly configurable, extensible and - as one component of the X1 Enterprise Platform - scalable. * Real-time indexing. Changes to files and deleted files are updated in the index automatically. * Support for Outlook Calendar and Task items. 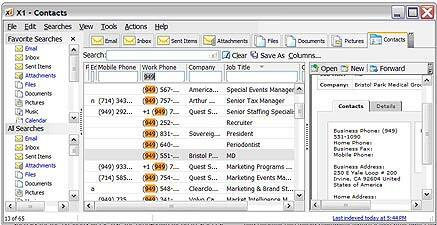 Users can search against virtually anything in Outlook. * Range searching means users just have to know a specific date/numeric range, not an exact date. * Drag and drop search results into emails or onto your desktop. * Support for Lotus Notes 7.0. * The X1 Enterprise Client federates search results from both the desktop and the X1 Enterprise Server. * Unicode support. Search multiple languages. * Ability to search network folders and enterprise content repositories. Using the free Enterprise Deployment Kit, IT administrators retain central control and can "switch on" end user access to network locations. X1 maps to Windows ACLs. The Enterprise Client really appeals to IT professionals who are under pressure to make their "customers" more productive without compromising information security. Download X1 Desktop Search | Download X1 Enterprise Kit - Good resource for IT Managers evaluation desktop search for their organization.